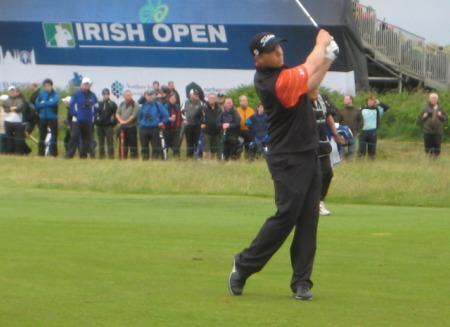 Chris Devlin during last year’s Irish Open at Royal Portrush. Picture via www.chrisdevlingolf.comIt took him nearly three days to get there but Ballymena’s Chris Devlin is certainly taking advantage of his first appearance of the Challenge Tour season in the Canaries. 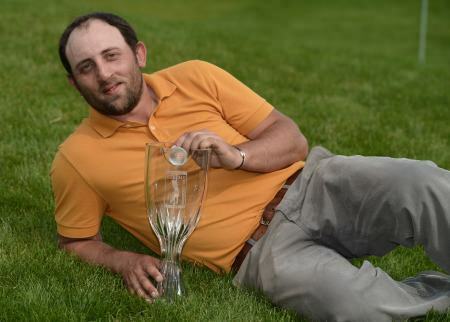 The Ballymena native, who has lived in Florida for many years, only discovered he had earned a place in the field for the Fred Olsen Challenge de España on Monday. But having taken planes and boats to get to the island of La Gomera, he added a three under 68 to his opening 69 to share 16th place on five under at halfway. The leaves him seven shots behind co-leaders but he’s not giving up hope of a top finish that could boost his chances of an invitation for the Irish Open at Carton House later this month. Unbelievable travel to @Challenge_Tour event this week. Left the US on Monday morning now nearly on La Gomera. 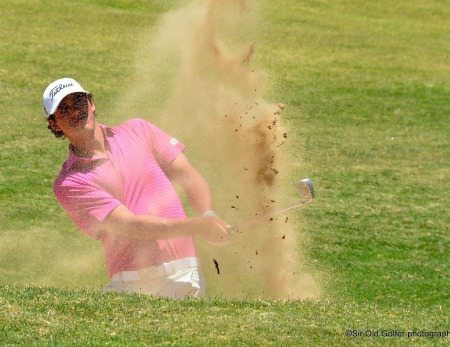 Via https://twitter.com/Chrisdevlingolf/Lurgan’s Gareth Shaw made the level par cut with ease when he made six birdies in a second successive 70 to share 34th spot on two under. But it was a day to forget for Simon Thornton, who missed the cut by a shot, adding a disappointing 75 to his opening 68. Koepka said: “I got off to a bad start with three putts at the first, and my putting just wasn’t there early on. I missed a bunch of short putts, but I was battling well. I’ve got a few issues to sort out on the greens. 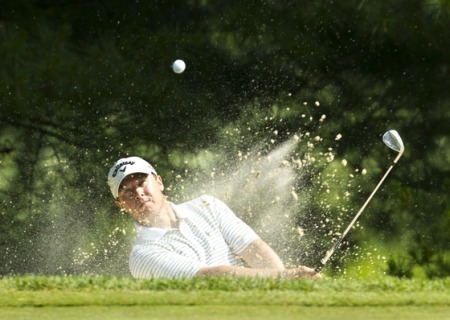 “I’m normally a good putter but I don’t know what happened today, it could be the speed. But I feel I’m playing well enough to win, I just have to try to find my form on the greens. 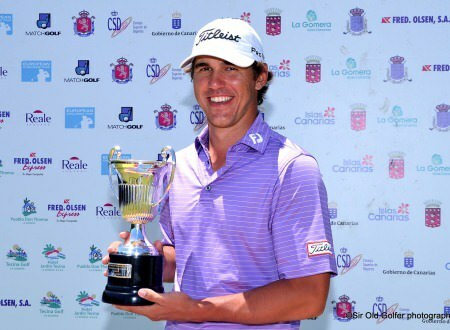 “I love playing on the Challenge Tour, it’s a lot of fun. It’s a great experience, you’ve got guys who have played on The European Tour for years, and you learn a lot from them. Dubois has previous European Tour experience, having graduated from the Challenge Tour in 2011, but the Frenchman struggled to stamp his authority on the top tier last year, finishing in 173rd place in The Race to Dubai. After some soul-searching and intense practice over the winter the 24 year old has rediscovered his form, and will head into the weekend in a strong position to capture his third Challenge Tour title. He said: “I played well again today, it was as windy as yesterday but I controlled my ball flight well. I was four under par after nine holes, which was the same start as yesterday, but then the wind really picked up and made life tougher. Dubois’ fellow Frenchman Julien Guerrier currently occupies third place on eight under par after signing for a round of 70, whilst the Spanish trio of Luis Claverie (66), Alfredo Garcia-Heredia (65) and Jesus Legarrea (70) share fourth place on seven under par alongside England’s Daniel Brooks (66), Belgian Pierre Relecom (68) and Switzerland’s Damian Ulrich (68). 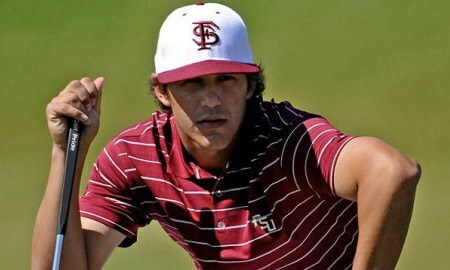 Leader Brooks Koepka. Picture via Fred Olsen Challenge de EspañaChallenge Tour starts are hard to come by but Chris Devlin is taking advantage of his first outing of the season in the Canaries.